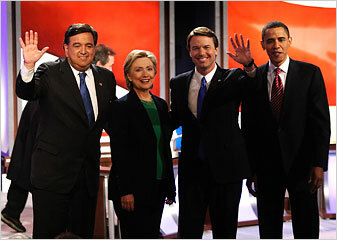 how BillRichardson and John Edwards each have a hand on Hillary Clinton’s back, while Edwards feels no need to connect to Barack Obama in that way, nor Obama to Edwards. I’m just sayin’. (The photo is by Doug Mills for the New York Times and accompanied this article about a debate). SNL long ago joked about how Richardson’s long-shot campaign was little more than angling for a spot on the Clinton ticket. What with the animosity between Obama and Clinton and their shared frontrunner status, I doubt either of them holds much hope — or desire — for being a vice presidential candidate if the other wins the nomination.